Everyone dreams of a White Christmas. But nobody dreams of one quite as much as Hal Benson. An out-of-work actor, Hal has been hired as a stand-in weather forecaster by a ratings-chasing news channel. Hal couldn’t care less whether it rains or not. It is just a job. But then he meets Lizzie Foster. A rival weather forecaster, on a far more serious channel, Lizzie is bright, determined, fascinated by meteorology – and very, very beautiful. She is the complete opposite of Hal. And yet sometimes opposites attract. After meeting at a conference – and after a spark develops between them – Lizze and Hal make a bet live on air. But as the big day approaches, their relationship turns out to be as unpredictable as the weather. And sometimes as stormy. Whilst everyone else is unwrapping presents, Hal and Lizzie are looking to the clouds for signs of snow. 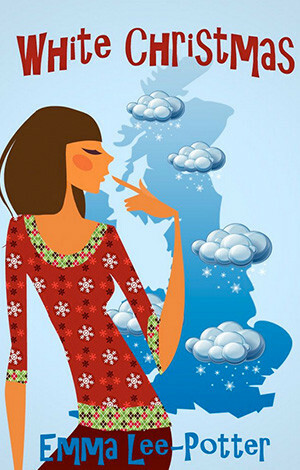 Will Hal and Lizzie overcome their meteorological differences – and find true love? ‘White Christmas’ is a sparkling romantic comedy that will delight anyone who believes the festive season is the perfect time for romance. It will enthrall fans of Sophie Kinsella, Jane Green and Jilly Cooper. Emma Lee-Potter is a novelist and journalist. She has written three novels, Hard Copy, Moving On and Taking Sides, and is the author of House With No Name, a blog about life, books, teenagers and France, as well as the best-selling ‘Olympic Flames’ and ‘School Ties’. Her books have been widely praised.